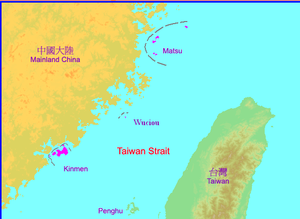 The Republic of China retreated to Taiwan in 1949 maintaining its de facto, if not de jure, independence, but Beijing has consistently refused formally to abandon the idea of reunifying Taiwan with China. As well as growing military pressure, the Peoples Republica of China (PRC) irredentist policy is premised on encouraging cross-Strait economic integration. Responding to preferential measures, Taiwanese industrialists have invested massively in the PRC, often relocating their businesses there. Fragments of a nation torn apart by contradictory claims, these entrepreneurs are vectors of a new form of unification imposed by the Chinese Communist Party, promoted but postponed on the island by the Nationalist Party, and rejected by a majority of the Taiwanese Taiwan & other islands remaining under its controlpopulation.Within what can be described as an unfinished civil war, socio-economic dynamics remain embedded in conflicts over sovereignty. Neutrality, combined with participatory democracy, is not a guaranteed recipe for a country’s lasting stability. But history suggests it is better insurance than the most sophisticated weapons systems. Taipei, Jul.3.– How can a small country like Taiwan best defend its democracy against the explicit threats of its stronger neighbours? How can it withstand the pressures of geopolitical aggression between great powers? I was born and raised in one neutral country, Switzerland. As an adult, I moved to and became a citizen of another neutral country, Sweden. I have experienced what it means to live in societies built on peaceful and stable ground. In 2017 my first home country, Switzerland, celebrated the 500th anniversary of its last military action abroad. In Sweden, more than 200 years have passed since the army was last engaged in foreign war (the occupation of neighbouring Norway). In both countries, neutrality has stood the test of time and reinforced the democratic nature of the governments. And this is why neutrality deserves more attention, especially in small and vulnerable democracies around the world.